Breeding Range: Breeds locally throughout southern Canada and eastern U.S. west to Minnesota and Oklahoma; local breeding populations in the western U.S. (Cink 2002). Breeding Habitat: Oak, Scrub Oak, Oak Opening, Pine Barrens, Sand Barrens, Jack Pine, Red Pine, Central Hardwood. Nest: Ground, 2 eggs directly on leaf litter. Nesting Dates: Eggs 7 May to 19 July. Two broods per breeding season possible, but not studied in Wisconsin. Migrant Status: Medium-distance Neotropical migrant. Arrival Dates: mid-April to late May. Departure Dates: mid-August to early October. Winter Range: Florida , Gulf Coast, Mexico, south to Nicaragua. Winter Habitat: Mixed woods close to open areas for foraging. In Wisconsin, the Whip-poor-will favors oak forests (Robbins 1991) with little underbrush as it does elsewhere in its range (Cink 2002). Proximity to foraging areas (clearings) and presence of shade also are important (Cink 2002). In the Baraboo Hills, Mossman and Lange (1982) found this species in dry oak or oak-pine woods. Within this land type, territories generally included small grassy openings for foraging. Whip-poor-wills may use gravel roads and wide trails in woods as foraging areas (Cink 2002). Little is known about specific microhabitat features of nesting territories. Usually they will nest under a shrub or sapling, which provides shade from the hot afternoon sun (Cink 2002). Because the Whip-poor-will rarely advertises its presence during normal birding hours, most populations outside of residential areas and campgrounds likely go unnoticed. Robbins (1991) noted that this species avoids populated, urban and suburban areas. In Wisconsin, the greatest frequency of reports from 1983 to 1996 were from southwest and northeast counties (Temple et al. 1997), where urbanization is limited. In a pattern similar to the decline in records from Wisconsin reported in Temple et al. (1997), the Whip-poor-will decreased 16.1% in Illinois from 1966 to 1994 (Cink 2002). Several other states have reported apparent population declines as well, despite the sampling difficulties associated with this species (Cink 2002). 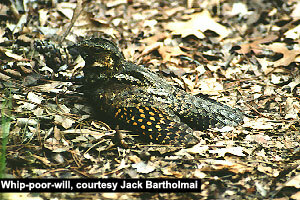 It is likely that many suitable, wooded habitats in the state have not been properly surveyed for Whip-poor-wills. It’s not clear what factor(s) may be limiting Whip-poor-will populations in Wisconsin and the Upper Midwest. There is concern about the availability of food, namely large woodland moths, for the Whip-poor-will (Anon 2002a; Cink 2002). Local destruction of food base by pesticides and habitat change may, in part, explain the patchy distribution of this species. Oak forests are of conservation concern in Wisconsin and it’s possible that regeneration problems and an increase in invasive shrubs may make existing habitat unsuitable for this species. However; there is currently no research in Wisconsin that points to possible reasons for Whip-poor-will declines. Cink (2002) identified common nest predators as skunks, raccoons, and foxes. Domestic or feral dogs and cats may be a concern, especially near residential areas. Causes of mortality of adults are not well understood. Mortality rates from collisions with automobiles (Cink 2002) and communication towers (Kemper 1996) are not well documented. Very little is known about the wintering ecology of the Whip-poor-will (Cink 2002). Morton (1992) ranked them as highly vulnerable to tropical deforestation. Because of the paucity of information on the Whip-poor-will, specific management recommendations are supported mostly by anecdotal evidence. Providing undergrowth for nesting sites and clearings for foraging areas may be equally important (Cink 2002). Limiting forest fragmentation may reduce the impact of nest predation. Because a nocturnal survey would provide a better estimate of abundance, documentation of territorial birds during similarly timed activities (i.e. frog and toad surveys) should be utilized. Cink (2002) identifies the following research needs for the Whip-poor-will: juvenile dispersal, fall departure dates, basic behavioral patterns, and the impact of human activities. Better estimates of population densities, species distribution, and population monitoring of this species in Wisconsin are needed. Currently it’s hard to recommend management for this species due to a complete lack of information on habitat selection and potential limiting factors on the breeding grounds. Also, the effects of forest fragmentation on the Whip-poor-will needs study (Cink 2002). Finally, the effects of gypsy moth control on Whip-poor-will foraging success are not known with certainty (Anon 2002b). Cink, C. L. 2002. Whip-poor-will (Caprimulgus vociferus). In The Birds of North America, No. 620 (A. Poole and F. Gill, eds.). The Birds of North America, Inc., Philadelphia, PA.
Anon. 2002a. Forest Birds of Minnesota. University of Minnesota - Duluth. : http://oden.nrri.umn.edu/mnbirds/Default.htm. Cink, C. L. 2002. Whip-poor-will. The Birds of North America, No. 620 (A. Poole and F. Gill eds.). The Birds of North America, Inc., Philadelphia, PA.
Kemper, C. 1996. A study of bird mortality at a west central Wisconsin T.V. tower, from 1957-1995. Pass. Pigeon. 58:219-236. Morton, E. S. 1992. What do we know about the future of migrant landbirds. Pp. 579-589 In: Hagan, J. M. III, and D. W. Johnston [eds.]. Ecology and conservation of Neotropical migrant landbirds. Smithson. Inst. Press, Washington, D.C.
Mossman, M. J., and K. I. Lange. 1982. Breeding birds of the Baraboo Hills, Wisconsin: Their history, distribution and ecology. Wis. Dep. Nat. Resour. and Wis. Soc. Ornithol., Madison. Robbins, S. D., Jr. 1991. 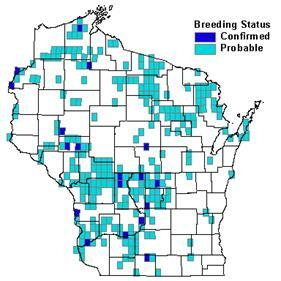 Wisconsin birdlife: Population and distribution past and present. Madison, WI: Univ. Wisconsin Press. Temple , S. A., J. R. Cary, and R. Rolley. 1997. Wisconsin birds: a seasonal and geographical guide, 2 nd edit. University of Wisconsin Press, Madison.